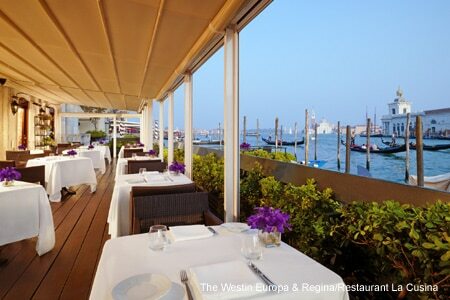 Romantic dining with a view of Santa Maria della Salute on the Canal Grande just steps from San Marco. : Entering the restaurant through the unassuming front door of The Westin Europa & Regina, Venice, from the little piazza just steps from the main San Marco “taxi stand” of authentic gondolas, reveals marble displays in black, white and pink adorning the halls and dining room. However, a much more stylish arrival can be achieved via a colorful gondola from the Canal Grande. Either way, you’re in for a treat. Guests are encouraged by courteous staff to start with an aperitivo (maybe a Bellini?) in La Chic..chetteria, the bar that seamlessly blends into La Cusina, while a table is being prepared on the private terrace or in the formal dining room. Chef Alberto Fol likes to feed his guests well, as he puts it, but he does not stray far from the original Venetian cuisine. Utilizing the produce of the sea and land close to Venice assures the freshness of every item delivered to the table. Fol gives original names to his dishes; try the “Four ways to savour fish from the Venetian lagoon” as a starter, or a main course called “Earth Energy, Sea Lightness Well Being” (barbecued octopus, potatoes and asparagus). You can also go for the veal served with pistachios and mushrooms. The kitchen is very friendly towards dietary or vegetarian considerations and offers gluten-free homemade ice cream for dessert. Consider the cheesecake with sautéed wild berries, too. The wine list of mostly Italian choices features many of the great vineyards as well as smaller labels that have been hand-picked to go with the menus.